. :Δέλτα Έβρου - Ένας υγροβιότοπος γεμάτος... ζωή!:. Management authority: Find out what' s behind Evros Delta. 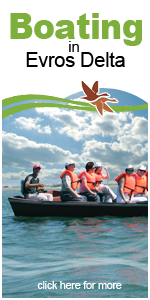 Activities: Everything we do together at Evros Delta! Photo gallery: Check out their lives through pictures! Go boating in Evros Delta: Explore | Relax | Enjoy! Evros Delta is an important wetland on a national, European and international level. For many years it is a Protected Area, as it has a big value for wildlife and humanity. In Evros Delta hundreds of thousands of birds find shelter and food all year round, while it constitutes a very important natural resource for the local community, because of his value for fishing, stock breeding, agriculture, climate, flood protection, education, recreation, science.